ATV riding is becoming very popular in America. With over 3.8 million square miles of differing climate and terrain, the geographical diversity of the United States makes it an ideal place for off-road activities such as riding All-Terrain Vehicles (ATV). The landscape will provide riders with countless places perfect for a riding vacation. Before operating a vehicle on one of the many amazing trails throughout the country, however, make sure that you understand the rules and laws. Each state has their own set of regulations that govern how these vehicles are operated, so be sure to review them before driving. Some of the largest and wildest trails are located along the East Coast of the country. Among these is the Hatfield-McCoy Trail System (HMT) located in West Virginia. The trail is open year-round, and it is one of the largest, spanning over 600 miles of bike and ATV tracks. To make a good route great, HMY also crosses the Appalachian Mountains, providing riders with some of the most spectacular scenery imaginable. 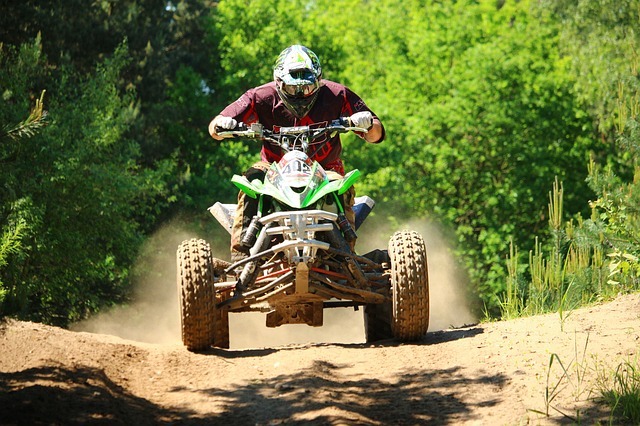 For mudding tracks in North Carolina, enthusiasts can venture to Busco Beach’s Recreational Riding Facility in Goldsboro. This park is 2000 acres of rider’s paradise. A bit further up north, two hours from Rochester, is New York’s Tall Pines ATV Park, containing 70 miles of tracks that are great for beginners and experienced riders alike. Best of all, these trails are well-maintained and provide camping areas for multi-day stays. The West Coast offers thrills that are different than the East Coast because of the change in terrain. Any enthusiast looking to experience a different style of ATV riding must visit Imperial Dunes in Brawley, California. It is here where the largest collection of sand dunes exist in the United States. Bordering Mexico, Glamis, as the place is also referred to, provides riders with three main riding areas and nearby campgrounds for extended stays. While in the state, enthusiasts must also visit California City and ride in the Mojave Desert. This area provides miles of unique landscape and a ride through the ghost town of Randsburg. Both California locations are hot and certain areas can be isolated. Therefore, visitors are encouraged to ride from October to April when the temperatures are less extreme. Riders should also ensure that their ATVs are in good condition to survive the rugged terrain. Check the engine, oil, and other basics. If attempting the long and isolated Mojave Desert, look to swap out your wheels for a fresh pair of ATV tires for sale and have the vehicle professionally checked. The Pacific Northwest offers a changing scenery that all must experience to truly understand. Off Highway 42, around the Florence and North Bend area, is Oregon Dunes National Recreation Area. The area stretches to cover 40 miles of lakes, dunes, and pine forest. This section of the country is also home to the Baumgartner Trails in the Sawtooth National Forest of Idaho. Apart from the ATV riding paths, this is an ideal place for camping and hiking. The national forest has hundreds of miles of riding trails that include some difficult terrain for more experienced drivers. Although there are a few campgrounds, most of the lodging will consist of camping. While riding through, visit the natural hot spring and prepare to overstay, as once there, it will be difficult to leave. If you are up for it, also remember that the non-continental portion of the country also has trails, and these are amazing. Both Alaska and Hawaii offer enthusiasts with breathtaking experiences. Therefore, be prepared to add these destinations to your riding bucket list.